Jaguar's business was founded as the Swallow Sidecar Company in 1922, originally making motorcycle sidecars before developing bodies for passenger cars. Under the ownership of S. S. Cars Limited the business extended to complete cars made in association with Standard Motor Co many bearing Jaguar as a model name. The company's name was changed from S. S. Cars to Jaguar Cars in 1945. A merger with the British Motor Corporation followed in 1966, the resulting enlarged company now being renamed as British Motor Holdings (BMH), which in 1968 merged with Leyland Motor Corporation and became British Leyland, itself to be nationalised in 1975. The Swallow Sidecar Company was founded in 1922 by two motorcycle enthusiasts, William Lyons and William Walmsley. In 1934 Walmsley elected to sell-out and Lyons formed S.S. Cars Limited funding the replacement of Walmsley's investment by issuing shares to the public. 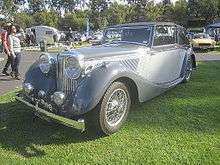 The SS Jaguar name first appeared in September 1935 on a 2.5-litre saloon, sports models of which were the SS 90 and SS 100. In spite of such a performance orientation, it was always Lyons' intention to build the business by producing world-class sporting saloons in larger numbers than the sports car market could support. 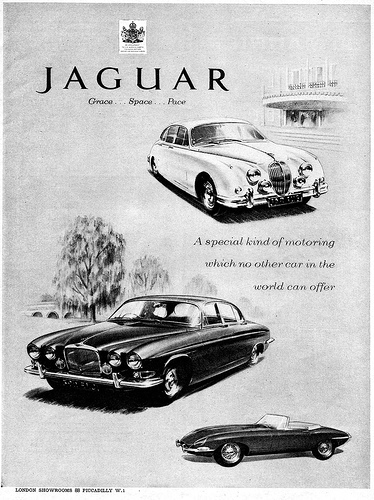 Jaguar secured financial stability and a reputation for excellence with a series of elegantly styled luxury saloons that included the 3 litre and 3½ litre cars, the Mark VII, VIII, and IX, the compact Mark I and 2, and the XJ6 and XJ12. All were deemed very good values, with comfortable rides, good handling, high performance, and great style. In 1950, Jaguar agreed to lease from the Ministry of Supply the Daimler Shadow 2 factory in Browns Lane, Allesley, Coventry, which at the time was being used by The Daimler Company Limited and moved to the new site from Foleshill over the next 12 months. Jaguar purchased Daimler — not to be confused with Daimler-Benz or Daimler AG—in 1960 from BSA. From the late 1960s, Jaguar used the Daimler marque as a brand name for their most luxurious saloons. Installed as chairman in 1980, Sir John Egan is credited for Jaguar's unprecedented prosperity immediately after privatisation. In early 1986 Egan reported he had tackled the main problems that were holding Jaguar back from selling more cars: quality control, lagging delivery schedules, poor productivity, and laid off about a third of the company's 10,000-some employees to cut costs. Commentators have since pointed out he exploited an elderly model range on which all development costs had been written off and raised prices as well as intensifying the push to improve Jaguar's quality but in the USA the price rises were masked by a favourable exchange rate. Under Ford's ownership Jaguar expanded its range of products with the launch of the S-Type in 1999 and X-type in 2001. Since Land Rover's May 2000 purchase by Ford, it has been closely associated with Jaguar. In many countries they share a common sales and distribution network (including shared dealerships), and some models now share components, although the only shared production facility was Halewood Body & Assembly, for the X-Type and the Freelander 2. However operationally the two companies were effectively integrated under a common management structure within Ford's PAG. The XE will be the first compact executive Jaguar since the 2009 model year X-Type and will be the first of several Jaguar models to be built using Jaguar's new modular aluminium architecture, moving the company away from the Ford derived platforms that were used in the past for the X-Type and XF. The use of Jaguar's own platform will allow the XE to feature either rear-wheel drive or all-wheel drive configurations, and it will become the first car in its segment with an aluminium monocoque structure. Originally announced at the 2014 Geneva Motor Show with sales scheduled for 2015. The Jaguar company started production with the pre-war 1.5, 2.5 and 3.5-litre models, which used engines designed by the Standard Motor Company. The 1.5-litre four-cylinder engine was still supplied by Standard but the two larger six-cylinder ones were made in house. These cars have become known unofficially as Mark IVs. The first post-war model was the 1948 Mark V available with either 2.5- or 3.5-litre engines, and it had a more streamlined appearance than pre-war models, but more important was the change to independent front suspension and hydraulic brakes. The big breakthrough was the launch in 1948 of the XK120 sports car, powered with the new XK twin overhead camshaft (DOHC) 3.5-litre hemi-head six-cylinder engine designed by William Heynes, Walter Hassan and Claude Baily. This engine had been designed at night during the war when they would be on fire watch in the factory. After several attempts a final design was achieved. That is until owner William Lyons said "make it quieter". The car had originally been intended as a short production model of about 200 vehicles as a test bed for the new engine until its intended home, the new Mark VII saloon, was ready. The XK120's exceptional reception was followed in 1954 by the introduction of the derivative XK140, and a much revised XK150. Along with sports cars, Jaguar maintained a strong place in the upscale saloon car market. 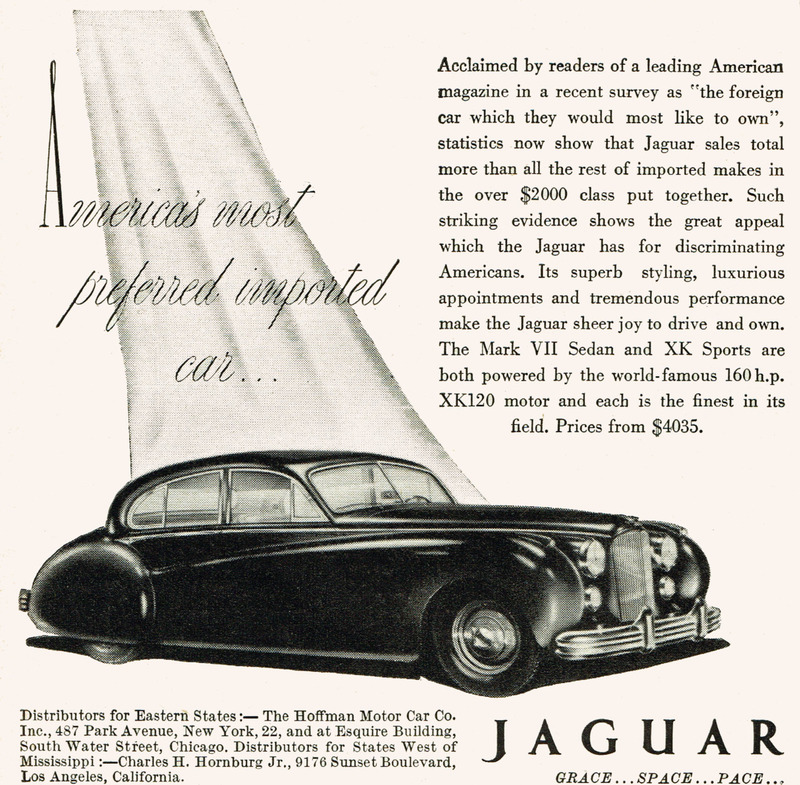 Introducing the large Mark VII in 1951, a car especially conceived for the American market, Jaguar was overwhelmed with orders. The Mark VII and its successors gathered rave reviews from magazines such as Road & Track and The Motor. 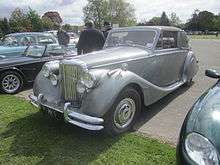 In 1956 a Mark VII won the prestigious Monte Carlo Rally. 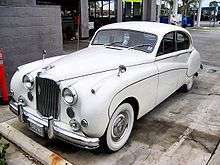 In 1955, the "2.4-Litre" saloon (subsequently known as the 2.4 Mark 1) was the first monocoque (unitary) car from Jaguar. 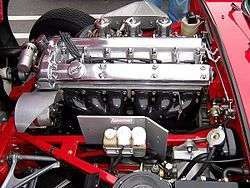 Its 2.4-litre short-stroke version of the XK engine provided 100 mph (160 km/h) performance. In 1957, the 3.4-litre version with disk brakes, wire wheels and other options was introduced, with a top speed of 120 mph (190 km/h). In 1959, an extensively revised version of the car with wider windows and 2.4, 3.4, and 3.8-litre engine options became the Mark 2. The 3.8 Mark 2 was popular with British police forces for its small size and 125 mph (201 km/h) performance. The Mark VIII of 1956 and Mark IX of 1958 were essentially updates of the Mark VII, but the Mark X of 1961 was a completely new design of large saloon with all round independent suspension and unitary construction. The independent rear suspension from the Mark X was incorporated in the 1963 S-Type, which closely resembled the Mark 2, and in 1967 the Mark 2 name was dropped when the small saloon became the 240/340 range. The 420 of 1966, also sold as the Daimler Sovereign, put a new front onto the S-type, although both cars continued in parallel until the S-Type was dropped in 1968. The Mark X became the 420G in 1966. ↑ "Employee relations". Jaguar – Environmental and Social Reporting. Retrieved 3 July 2009. ↑ "Tata Buys Jaguar Land Rover for $2.3 Billion". Autoblog.com. Retrieved 19 June 2009. ↑ "The Years 1989 to 1986". Jaguar Cars Ltd. Retrieved 19 June 2009. ↑ "Cameron gets a new Jag to go with the new job – Autoblog UK". Uk.autoblog.com. 13 May 2010. Retrieved 30 November 2010. 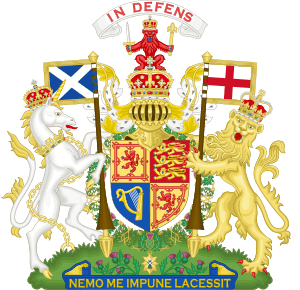 ↑ "The Royal Warrant Holders ' Association – Directory of Royal Warrant Holders". Archived from the original on 12 December 2007. Retrieved 24 December 2007. ↑ Rueters (24 September 2013). "Jaguar Land Rover to open new £100 million R&D centre in UK in 2016". Reuters. ↑ Online, AM. "Jaguar Land Rover to build £100m Warwick research facility". ↑ "The Years 1932 to 1935". Jaguar Cars Ltd. Retrieved 26 December 2008. 1 2 "The Lyons share – interview with WL". Motor: 18–21. 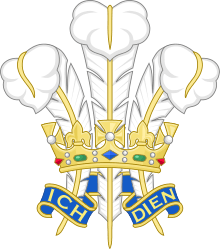 19 February 1972. 1 2 "The classic has to be "Grace... Space... Pace," which was used throughout the 1950s and 1960s". Clausager, Anders Ditlev (2010). "Jaguar: A History of Grace and Pace". editorial.autos.msn.com. Archived from the original on 27 March 2014. Retrieved 2 September 2013. ↑ Walton, Paul (13 December 2012). "Grace… Space… Pace". jaguar-world.com. Archived from the original on 27 March 2014. Retrieved 27 March 2014. ↑ Peterborough, Brave Creative (19 November 2010). "Jaguar: 75 Years of Grace, Space and Pace". themomentmagazine.com. Retrieved 27 March 2014. ↑ "1306381302_a13c957db6_4840.jpg (JPEG Image, 374 × 500 pixels)". typophile.com. 28 August 2011. Archived from the original on 27 March 2014. Retrieved 27 March 2014. ↑ "tumblr_lwqh6th15q1qchs1zo1_1280.jpg (JPEG Image, 1280 × 1256 pixels)". 31.media.tumblr.com. 24 December 2011. Archived from the original on 27 March 2014. Retrieved 27 March 2014. ↑ "The Years 1968 to 1979". Jaguar Cars Ltd. Retrieved 26 December 2008. ↑ Utton, M. A. (2003). "9 – Vertical integration and vertical mergers". Market Dominance and Antitrust Policy. Cheltenham, Glos, UK: Edward Elgar Publishing. p. 226. ISBN 1 84064 728 0. LCCN 2002029832. Retrieved 6 November 2014. 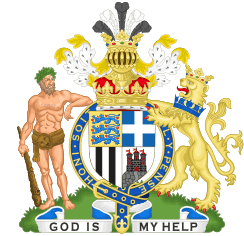 ↑ Douglas-Scott-Montagu, Edward John Barrington & Burgess-Wise, David (1995). "Chapter 9 – Under New Management". Daimler Century: The full history of Britain's oldest car maker. Sparkford, Nr Yeovil, Somerset, UK: Patrick Stephens. p. 283. ISBN 1 85260 494 8. ...Sir George Harriman of the British Motor Corporation (whose Pressed Steel subsidiary supplied Jaguar bodyshells) offered Lyons a 'logical and beneficial' merger deal, which would leave Jaguar operating under Lyons's chairmanship as 'a separate entitiy and with the greatest practical degree of autonomy' within a new organization called British Motor (Holdings) Limited. ↑ "British Motor Takes That New Label". The Times (56815). London. 15 December 1966. p. 17. ↑ Elliott, Larry (22 November 2000). "A whole world sold on sell-offs". The Guardian. London. Retrieved 26 December 2008. ↑ "The Years 1989 to 1996". Jaguar Cars Ltd. Retrieved 10 May 2007. ↑ "Although Land Rover remains profitable, Ford has never managed to make money from its investment in Jaguar." "Tata buys Jaguar in £1.15bn deal". BBC News. 26 March 2008. Retrieved 3 September 2013. ↑ "India's Tata confirms interest in Land Rover, Jaguar". forbes.com. AFX News Limited. 24 August 2007. Archived from the original on 8 December 2007. Retrieved 18 December 2007. ↑ Clark, Nick (4 January 2008). "Tata in pole position to buy Jaguar and Land Rover marques from Ford". The Independent. London. Retrieved 4 January 2008. 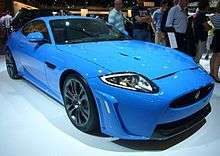 ↑ "JCB's Sir Anthony Bamford eyes Jaguar". Contract Journal. 24 August 2006. ↑ Doval, Pankaj (24 December 2007). "M&M out of Jaguar, Land Rover race". Times News Network. Retrieved 24 December 2007. ↑ Krisher, Tom (3 January 2008). "Indian Company Top Bidder for Jaguar". Time. Associated Press. Retrieved 4 January 2008. ↑ "Tata set to clinch Jaguar-Land Rover deal: Report". Press Trust of India. 20 December 2007. Archived from the original on 23 December 2007. Retrieved 20 December 2007. ↑ Robbins, Mathieu (17 December 2007). "Ford set to pick Jaguar frontrunner in days: source". Reuters. Retrieved 16 February 2011. ↑ Ghosh, Suprotip (3 January 2008). "Super car technology headed for Tata stable". Hindustan Times. Retrieved 4 January 2008. ↑ Leahy, Joe; Simon, Bernard; Yee, Amy (4 January 2008). "Tata falls for the attraction of opposites". Financial Times. Retrieved 4 January 2008. ↑ "Ball now in Tata Motors' court to tie-up deal: Unite". CNBC TV-18. 3 January 2008. Retrieved 4 January 2008. ↑ "Tata gets $3 billion loan from Citi, JPMorgan: source". Reuters. 18 March 2008. Retrieved 18 March 2008. ↑ "FORD MOTOR COMPANY ANNOUNCES AGREEMENT TO SELL JAGUAR LAND ROVER TO TATA MOTORS" (Press release). Ford Motor Company. 26 March 2008. Retrieved 27 March 2008. ↑ "5 for 2 special: Tata acquires 3 other British marques in Jaguar, Land Rover deal". Leftlane News. 28 March 2008. Retrieved 28 March 2008. ↑ "Tata Motors completes acquisition of Jag, Land Rover". Thomson Reuters. 2 June 2008. Retrieved 2 June 2008. ↑ "On U.S. tour, Mr. Tata gives Jaguar and Rover dealers a hug: AutoWeek Magazine". Autoweek.com. Retrieved 4 May 2009. ↑ "Jobs warning at Jaguar Land Rover". BBC News. 26 June 2009. Retrieved 26 June 2009. ↑ "Jaguar History". The Surrey Region Jaguar Enthusiasts Club. ↑ Healey, James (2 July 2012). "Disguised Jaguar F-type sports car runs at Goodwood". USA Today. Retrieved 1 August 2012. ↑ "CAR Magazine: Jaguar F-type (2013) first official pictures". Retrieved 28 September 2012. ↑ "Jaguar XE Launch Press Release". ↑ "New Jaguar saloon to be called XE". Auto Express. 4 March 2014. Retrieved 4 March 2014. ↑ "Jaguar Cars UK Web Site". www.jaguar.co.uk. Retrieved 24 May 2010. ↑ "Jaguar XJ Series". Autocars.co.uk. Retrieved 19 June 2009. ↑ Plisner, Peter (9 July 2009). "Changing face of Jaguar". BBC News. Retrieved 15 July 2009. ↑ "Jaguar XJ – models". Jaguar Cars Ltd. Retrieved 19 June 2009. 1 2 3 "r_Specifications". Jaguar Cars. ↑ Spinks, Jez. "Jaguar rules out SUV but not crossover CarAdvice". Retrieved 24 July 2012. ↑ Consumer Reports, Buying Guide 2007, 211. ↑ Wearden, Graeme (15 July 2009). "300 jobs lost at Jaguar's Halewood plant". guardian.co.uk. London: Guardian News and Media. Retrieved 15 July 2009. ↑ "Jaguar XK Guide". carpages.co.uk. Retrieved 16 May 2010. ↑ "The monster and the myth – It is the story they've been waiting for with bated breath". The Guardian. 22 August 1992. On the Nardo track of southern Italy, Martin Brundle, the Grand Prix driver, confirmed it as the fastest production car with 217mph, narrowly quicker than the Bugatti. The Ferrari 512 or earlier F40 does around 200mph. The F40 boasts 0-60mph in 4.1 seconds. The Lamborghini Diablo is 4.09 and Porsche 959, 3.9. The Jaguar rates 3.85. ↑ Manwaring, Leonard Albert, ed. (1969). The Observer's Book of Automobiles (Fifteenth ed.). F. Warne. p. 137. ↑ "Jaguar's First-Ever SUV Is Stunning". Business Insider. 16 January 2015. Retrieved 16 January 2015. ↑ BBC Top Gear. Accessed 10 July 2013. ↑ "Double loss for motor sport". Motor Sport. 16 December 2010. Retrieved 21 April 2014. ↑ "Red Bull snaps up Jaguar F1 team". BBC News. 15 November 2004. Retrieved 21 April 2014. ↑ "Jaguar XJ13 - Building the Legend". 14 June 2013. Retrieved 14 June 2013. ↑ "Future Jaguar XJ May Cut CO2 Via Lotus 'LimoGreen' Project". Green Car Reports. 20 February 2009. Retrieved 4 May 2009.